The content mode specifies how the cached bitmap of the view’s layer is adjusted when the view’s bounds change. For an image view, this is talking about the image. For a view that draws its content, this is talking about the drawn content. It does not affect the layout of subviews. iOS Dev Tools is a list showcasing the greatest iOS development tools, including websites, desktop and mobile apps, and back-end services. I’ve tried to group the tools into logical categories and will mark any newly added tools as NEW. Think most everything there of great interest we’ve bothered mentioning at some point over the years — with the notable exception of the ‘Networking and APIs’ section, have to check those out sometime —but it certainly is nice to have them all nicely curated in one place! In case anyone else ever has this question, I finally solved it by adding a breakpoint in NSApplicationMain() (for plain C programs, main() would of course work as well). 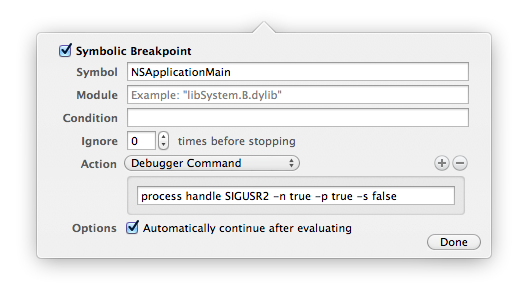 I set the breakpoint action to process handle SIGUSR2 -n true -p true -s false , and enabled the "Automatically continue after evaluating" option. If anyone has a more elegant solution, I'd be happy to hear.